"The opposite of nature is impossible." 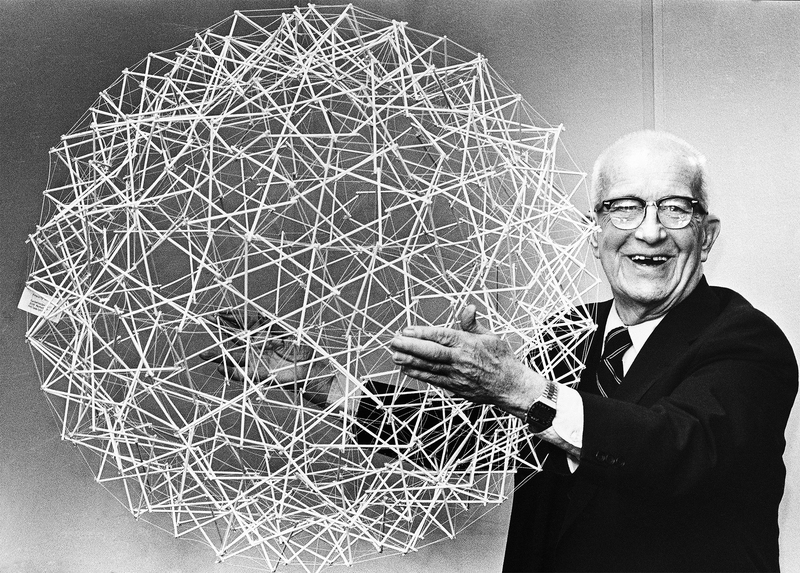 R. Buckminster Fuller holds up a Tensegrity sphere. 18th April, 1979. There are few men who can justly claim to have revolutionized their discipline. 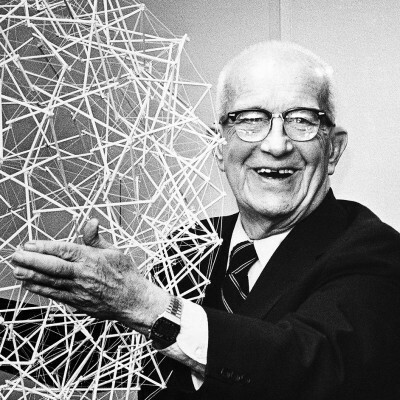 R. Buckminster Fuller revolutionized many. “Bucky,” as he was known to most, was a designer, architect, poet, educator, engineer, philosopher, environmentalist, and, above all, humanitarian. Driven by the belief that humanity’s major problems were hunger and homelessness he dedicated his life to solving those problems through inexpensive and efficient design. The grandnephew of the American Transcendentalist Margaret Fuller, Bucky was born on July 12, 1895 in Milton, Massachusetts. He was twice expelled from Harvard. Later, Bucky married Anne Hewlett in 1917 and went into the construction business with her father. A decade later he witnessed the first of many business failures, when, due to economic difficulties, he was forced out of the company. Despondent over these failures and family problems, he resolved to focus his energies on a search for socially responsible answers to the major design problems of his time. Recognizing the inefficiency of the automobile, Bucky spent the late twenties designing a car that would incorporate the engineering advances of the airplane. In 1933, he presented the first prototype of the Dymaxion car. The Dymaxion car could hold twelve passengers, go 120 miles per hour and used half the gas of the standard car, utilizing aerodynamics construction and only three wheels. While demonstrating the car to investors, it crashed, taking one life. Though the crash was later determined not to be the fault of the car, he was never able to find adequate funding. As World War II ended and housing crises in America became more acute, he turned his sights to what would remain his life-long dream. Using airplane construction methods and materials, Bucky set out to create a pre-fabricated house that could be easily delivered to any location. It would be fireproof and inexpensive and constructed out of light weight materials. In 1945 however, with thousands of orders in place for his new Dymaxion House, Fuller once again ran into difficulties with investors and had to end the project. Unsure of his next step and without a job, Bucky accepted a position at a small college in North Carolina, Black Mountain College. There, with the support of an amazing group of professors and students, he began work on the project that was to make him famous and revolutionize the field of engineering. Using lightweight plastics in the simple form of a tetrahedron (a triangular pyramid) he created a small dome. As his work continued it became clear that he had made the first building that could sustain its own weight with no practical limits. The U.S. government recognized the importance of the discovery and employed him to make small domes for the army. Within a few years there were thousands of these domes around the world.